The name Nuppeppo is a form of slang, in Japanese, given to women that applied too much makeup causing their face to become indiscernible much like the creature. 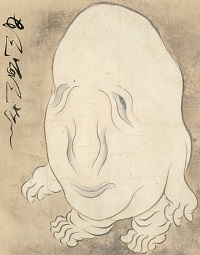 The yokai is described to appear as a short, humanoid, blob of flesh with facial features sagging within its skin folds. In legends, the Nuppeppo’s feet, hands and other limbs are just extensions of its own fatty body taking form. Also to note, a pungent odour, worst than rotting flesh, follows the creature. Japanese folklore mentions this yokai is a rare, solitary creature wandering aimlessly in deserted villages, abandoned temples or graveyards and forgotten roads at night. The Nuppeppo poses no threat to humans, yet is known to delight in play pranks on people. It would at times enter villages to run around disgusting people with its appearance and odour. This would result the locals to chase out the Nuppeppo and get killed if caught. Images of the Nuppeppo are in works such as the 1737 Hyakkai Zukan, however its origins remains unknown. One legend, says a vain noble became cursed to exist as the hideous massive of flesh. Another depicts an inexperienced shape-shifting yokai failed in a transformation and now stuck in that form. There are a few myths told where eternal youth could be obtained by anyone who consumes the Nuppeppo’s flesh. They say that Japanese cuisine is an acquired taste. If they slapped this on my plate I’d be outta there …. “eternal youth” or not! Completely agreed David. Recently, read some new Japanese folklore as they will be posted for future articles.